Picking a bridesmaid dress that suits all your best friends is nearly as laborious a shopping task as finding your dream wedding gown. It takes serious time, with hours upon hours being spent sifting through dozens of racks of dresses. Because when you have to consider the varying tastes and budgets of your bridesmaids (and of course, whether or not the dress will complement your bridal gown and wedding setting), it's all about being strategic in your choices. If you're all for optimizing cost per wear for your bridal party, consider these unique bridesmaid dresses that don't look like, well, the typical bridesmaid dresses (and can be worn long after the ceremony ends). Or if you want to ensure your friends don't have dish out too much money, these under-$200 picks look like they cost much more than their wallet-friendly price tag. And finally, if you want a dress that flatters a variety of skin tones, is versatile, and screams fall time, why not consider a burgundy bridesmaid dress? Ahead, we found 33 trendy burgundy dresses your bridal party is going to love wearing at the wedding (and long after the ceremony is over, as well.) Curious to see our finds? Then read on to shop our extensive burgundy bridesmaid dress edit below. An easy-breezy bridesmaid dress you can wear after the wedding as well. Available in sizes UK8 and UK18. What's not to love about this beautiful burgundy dress? Available in sizes UK6 to UK18. This dress is simple and sleek, which is perfect for every bridesmaid in your wedding. Available in sizes 4 to 6. A simple dress with eye-catching shoulder detailing. Available in sizes 16 to 20. This dress gives off serious '90s vibes with its thin straps—and we're loving it. A velvet pick perfect for a fall wedding. After the ceremony, slip into a pair of sneakers for a sporty-chic look. An easy dress that can be styled in so many ways. Available in sizes 17 to 21. We're loving how streamlined and sleek this dress is—don't you agree? Available in sizes 2, 8, and 14. Now, this is a statement-making coat that can certainly be worn as a bridesmaid dress. When in doubt, opt for a minimalist bridesmaid dress with an eye-catching neckline just like this one. Available in sizes IT42 to IT44. This burgundy bridesmaid dress is so romantic. We're loving this off-the-shoulder style for an early fall wedding. The perfect minimalist-sleek bridesmaid dress. Or how about an off-the-shoulder style in a maxi cut? Just as pretty. We're loving this elegant one-shoulder neckline. How about this one-shoulder design with the eye-catching front twist detailing? Another pretty pick you can wear long after the wedding is over. 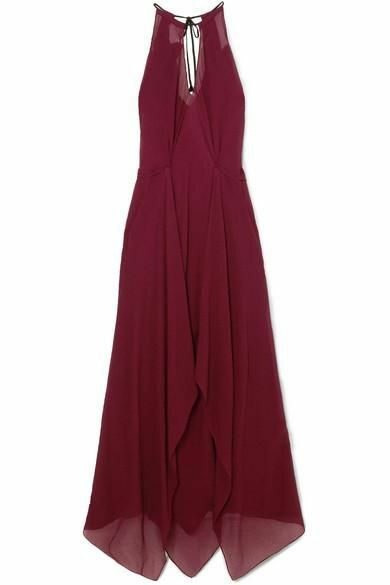 We can just picture this burgundy bridesmaid dress being worn during a whimsical outdoor fall ceremony. How elegant is this one? A more casual bridesmaid dress pick but a great investment piece to wear long after the ceremony has come to an end. Available in sizes IT44 to IT46. Wait until you see the back on this '90s-inspired number. We're all for an all-over lace bridesmaid dress. This is slightly pricier than the other dresses, but it's so good. We can't stop staring at this pretty burgundy bridesmaid dress. The back on this burgundy number is so eye-catching. A flattering cut and a gorgeous shade. Try a burgundy floral-print dress for your next autumn wedding. This one is so versatile. Available in sizes 0 to 24. For the bold bridesmaid at your wedding. Two perfect fall colors in one beautiful dress. Available in sizes 0 to 18. Next up, shop some of the prettiest floral bridesmaid dresses we've been eyeing.